All pillows are designed to be soft and comfy, but you deserve the best of the best. Sleep is something that’s so incredibly important, and there’s no better way to get a perfect night of sleep than with the Bamboo Memory Foam Pillow. Not only is this pillow supremely soft, but it’s also infused with Aloe Vera to help naturally disinfect. 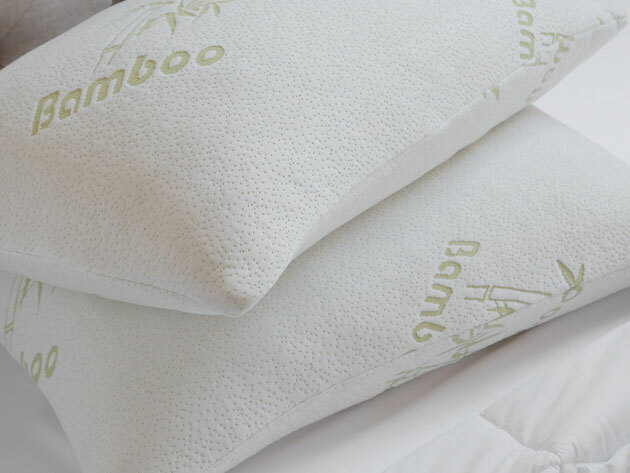 Having the Bamboo Memory Foam Pillow is like sleeping on a cloud. Your head is so comfortable that you’ll drift off to sleep immediately. This pillow is the perfect solution for those who have trouble falling asleep at night. Each pillow is constructed from pressure-relieving memory foam that contours perfectly to the shape of your head. It’ll help loosen the tension in your neck and back from a long day at work. The pillow cover is constructed from premium bamboo that is hypo-allergenic and anti-microbial. With a light infusion of aloe vera, the Bamboo Memory Foam Pillow always stays fresh. Get yourself the world’s most comfortable pillow this President’s Day sale. Originally, the Bamboo Memory Foam Pillow was 59% off. Be sure to use coupon code PREZDAY15 for an additional 15% off, which brings your total down to $33.99!